When users are not eager to search the Internet themselves, they rely on third-party applications like Desktop Recipe. As long as those programs are reliable, this kind of practice is not dangerous. However, in the case of Desktop Recipe, the situation is quite different. This tool is nothing but an adware program that has been designed to collect information on what websites you frequent. If you do not remove Desktop Recipe immediately, there is a good chance that eventually Desktop Recipe will be exploited by cyber criminals to redirect you to malware-related websites or infect you with severe computer security threats. 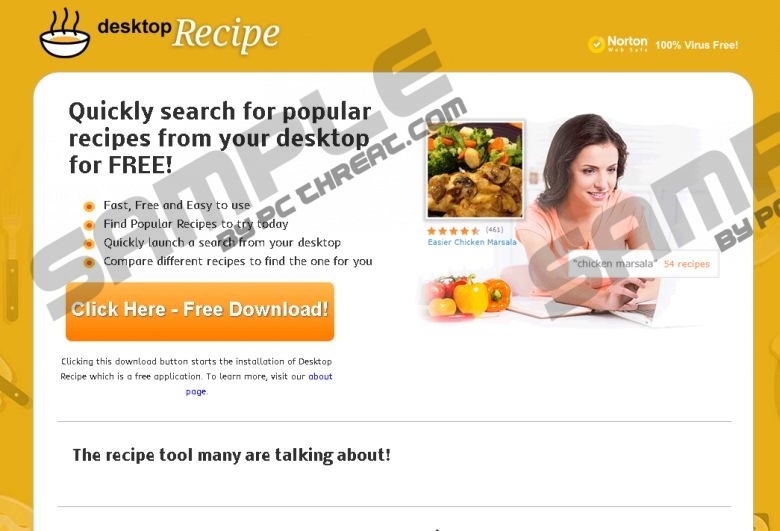 We perfectly understand why users might think Desktop Recipe is a reliable application. This program is promoted heavily on its official website. You can access the page via desktoprecipe.com. The moment you enter the site you are greeted with the Norton Antivirus logo, which implies that the application is 100% Virus free. However, it is far more likely that the developers of Desktop Recipe put the logo there to make the unsuspecting users believe that this program is absolutely safe. As far as out research is concerned, we have not found any link between Desktop Recipe and actual computer security programs. Next, it might be hard to regard Desktop Recipe as a potential computer threat because the application is merely supposed to help you “quickly search for popular recipes from your desktop for free.” This is what the main promotional tagline on the website says. Nevertheless, we should remember that nothing comes for free nowadays and there is definitely a catch to it. If you were to check out the additional information on the website, you would see that Desktop Recipe “may show advertisements.” The third-party ads in this case would be your biggest security concern. On top of that, you most probably will have to remove more unwanted applications from your computer because chances are you have not downloaded Desktop Recipe from the official website. It is far more likely that this program entered your system in a software bundle. That is the main adware distribution method nowadays, and all the related applications, like Finance Alert, Celebrity Alert, News Alert, and so on have been distributed in the same manner. That is why we are sure that you have at least several unwanted applications installed on your PC. If you want to find out what programs you must delete from your system, scan your computer with the SpyHunter free scanner and the list will be generated for you at once. Desktop Recipe might look like an annoying application that merely floods you with commercial pop-ups, but in reality this program could become a bridge for cyber criminals to reach you. Do not hesitate to remove Desktop Recipe from your system as soon as possible. Also, remember that manual removal may not be enough to ensure your computer is fully protected against similar intruders. Therefore, once you delete Desktop Recipe, please acquire a computer security application of your choice. Your system’s security should be your utmost priority. Open Uninstall a program and remove Desktop Recipe. Go to Uninstall a program and remove Desktop Recipe. Select Add or remove programs and uninstall Desktop Recipe. Quick & tested solution for Desktop Recipe removal.